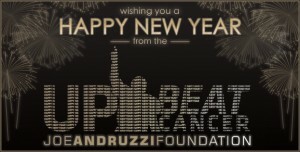 Still Time To Donate Before The Ball Drops! On behalf of the entire Joe Andruzzi Foundation, we hope all is well and that you are finding time to enjoy friends and family this holiday season! You can still make a donation to JAF before the tax year comes to a close – but time is running out! It’s easy! Just visit our new “Ways to Give” page on the JAF website to browse the various ways you can support JAF – or, you can just keep it simple and visit our “Donate Now” page here! Remember, JAF is a 501(c)(3) not-for-profit organization, so all donations are tax deductible. As always, proceeds support our mission of providing help, hope, and a reason to smile for cancer patients and their families by contributing financial and emotional support when it is needed most! Can you believe 2016 is coming to a close? Before we turn the calendars to 2017, let’s recap everything that kept the Joe Andruzzi Foundation busy in December! The holidays bring about many opportunities to share quality time with friends and family, appreciate what we have, and celebrate with those we love. In other words, this time of year renews our faith in the most precious of gifts: hope. Unfortunately, hope is not guaranteed to everyone, and there are countless patients across New England each day being confronted with the hardships of a cancer diagnosis. There is good news for these patients, though: YOU! You have the unique ability to spread hope this holiday season by becoming a member of the Joe Andruzzi Foundation’s Smile Brigade – annual donors committed to alleviating the financial and emotional burdens of cancer so patients can focus on what really matters: getting better. Donate today by making your annual, tax-deductible contribution by joining the monthly (Up)Beat Pledge Program! Run United NYC Half Marathon With Team JAF! On Sunday, March 19, 2017, the Joe Andruzzi Foundation’s Team JAF runners will once again take to the streets of Manhattan for the United Airlines NYC Half Marathon, and we want YOU to come along for the ride (or, run!). The race will take Team JAF runners on a 13.1-mile tour of NYC, stopping traffic in Manhattan, from Central Park through Times Square to South Street Seaport – all to raise funds in support of JAF’s mission! To apply, or for more information, click here! Patriots Roll Jets; Goal Line Giving Finale Set for Sunday vs Fins! The Patriots went 4-0 in the month of December, scoring 113 points over four games. 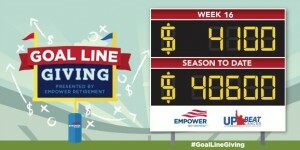 Thanks to Empower Retirement’s dedication to tackling cancer’s impact on the patients we serve, the Goal Line Giving scoreboard is up to $40,600 this season through 16 weeks! We’re looking to close out the campaign with one last big matchup versus the Dolphins on Sunday! As a reminder: for every point New England scores during the 2016 regular season, Empower Retirement will donate $100 towards the Joe Andruzzi Foundation’s mission. Follow along with the Foundation’s social channels using the #GoalLineGiving hashtag – JAF’s Twitter and Instagram accounts will be live-updating fundraising totals as each point is scored during games this season. Be sure to bookmark this page as well and check back weekly as we update the Goal Line Giving scoreboard. A New Year is on the immediate horizon, and with it comes one certainty: Winter is coming. There is good news, though! You can escape to Aruba this winter and help JAF patients at the same time! 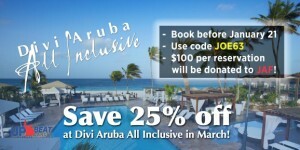 The Joe Andruzzi Foundation is partnering with Divi Aruba to help (Up)Beat cancer! Divi Aruba will donate $100 per reservation booked between now and January 21, 2017 for Aruba travel in March using the code JOE63. Supporters taking advantage of the promotion can also receive a special thank you from Joe himself with an autographed photo and at the meet and greet on March 20th at the Divi Aruba resort. For reservations and more information, contact 1-800-554-2008 or book now online! Last Chance To Support JAF While You Shop This Holiday Season! ALEX AND ANI has been a huge supporter of our mission for years, and we want to share just how proud and excited we are for their amazing Liberty Copper Collection – featuring pieces containing original copper preserved from the Statue of Liberty’s centennial restoration. Just as the Statue of Liberty shines her perpetual light of positivity, JAF and ALEX AND ANI encourage everyone to spread their own light to the world. You can help us #CARRYLIGHT for cancer patients in need through ALEX AND ANI’s online store – purchase items before January 1, 2017 (SUNDAY!) by clicking through this link [http://bit.ly/2caTdh4] and 10% of your sale will be donated back to the Joe Andruzzi Foundation. Get Ahead Of Those New Year’s Resolutions! The Joe Andruzzi Foundation is excited to partner with 20Lighter – a doctor-supervised weight loss program completely personalized for each individual client (like JAF President Joe Andruzzi!). 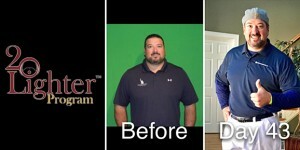 Visit www.20Lighter.com to learn more – and mention JAF when signing up and a portion of your program fee will be donated back to support Joe Andruzzi Foundation patient families! We have filled all of our charity spots but if you are a qualified, registered runner and would like to run with Team JAF, please click here for more information. Katie Dolaher – a personal trainer & cycling instructor at B/SPOKE Studios in Boston – is paying-it-forward to the Joe Andruzzi Foundation this December! Through the end of the year (only a few days left! ), $1 will be donated to JAF each time you check into one of Katie’s B/SPOKE Studios & ReebokBoston classes through the MoveWith app! Check out Katie’s schedule at: https://www.movewith.com/katieDolaher and help us send a huge #UpBeatCancer thank you for her efforts in support of JAF’s mission!